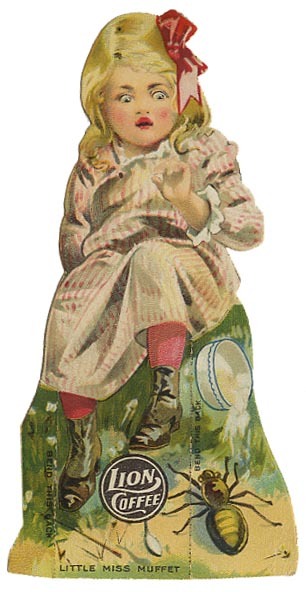 The theme for Sepia Saturday this week was almost too easy for me: vintage advertising paper dolls. I have many in my collection. 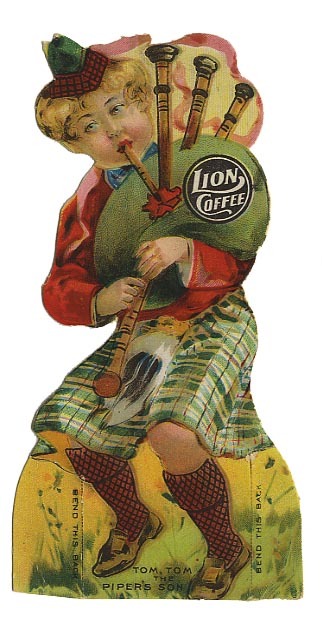 The following are all from the Lion Coffee "Children's Dolls With Stories" collection. In total there are 30 dolls to collect. I have yet to find all of them. 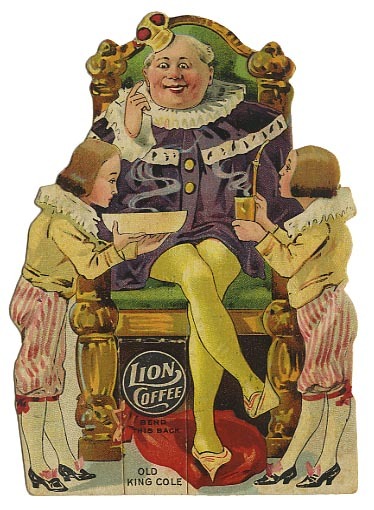 The Lion Coffee company was owned by Alvin Mansfield Woolson. 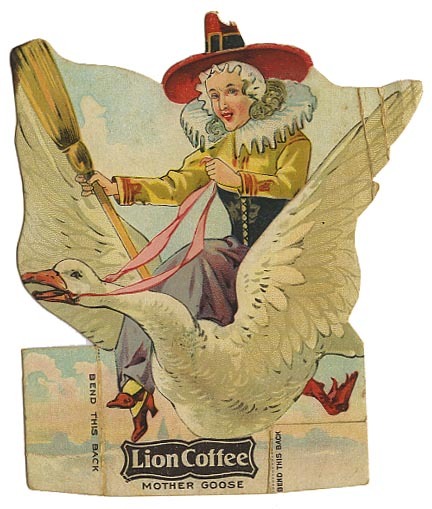 Alvin M. Woolson was born in Huron Ohio, October 5, 1840 (always considered a good year for coffee in this office). Brought-up by foster parents, the boy did his share of farm labor, attending school only during the three winter months of the year. He worked in a country store, and later took a turn as a printers devil for the Sandusky Register. At the outbreak of the Civil War young Alvin enlisted in the First Regiment, Ohio Volunteers. In the course of the War, he received as appointment as Sergeant Major, of Artillery, in the Army of the Patomac. In the aftermath of the war, Woolson moved west with the Union Pacific Railroad of E.H. Harriman, working in the capacity of accountant. In later years he recounted that among his duties was to ward off Indian attacks. With his feelings of wonderlust fullfilled and the railroad complete, Woolson moved back to Ohio where he clerked in a country store for a year prior to making the decision to set up for himself which he did, in the town of Wauseon with a capital of $125.00. He subsequently courted and married Francis (Frankie) Tillinghast and settled in Toledo in 1875. There he opened a grocery store on Adams Street near 12th. There were opportunities for a fellow with ambition, and a grubstake, in the wholesale grocers trade and Alvin Woolson was not a man to let grass grow beneath his feet. In 1882 the Woolson Spice Co. was formed with a capital of $30,000.00 which represented significant local support from Toledo's business community including John Berdan and James Secor. The old Warren & Bidwell company was in financial straights and was to fall under the gavel at a government forclosure sale. Woolson was the successful bidder. Woolson was a man possessed. 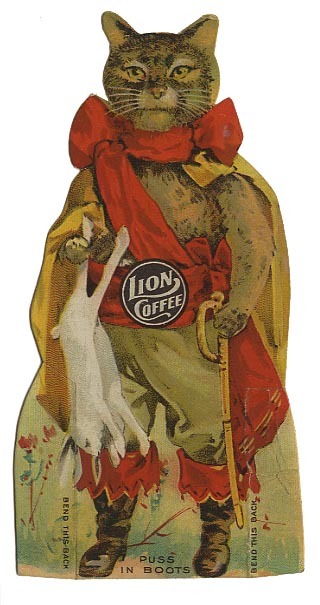 He was tireless in his efforts to establish Lion Coffee as a major brand. It was 10 years before the first profits were realized. Then the tide came in and over the next five years over million profits were realized. Click here to see a photo of Woolson. I wonder if those who created these advertising premiums ever thought about their work still being around long after they were gone. Did they imagine these little scraps of paper would last well over a hundred years and be sought after? I doubt it. These were items meant to be played with and tossed. I'll admit there are books I've designed that I know will be around for decades after I'm gone. I hope they provide pleasure to those who find them. 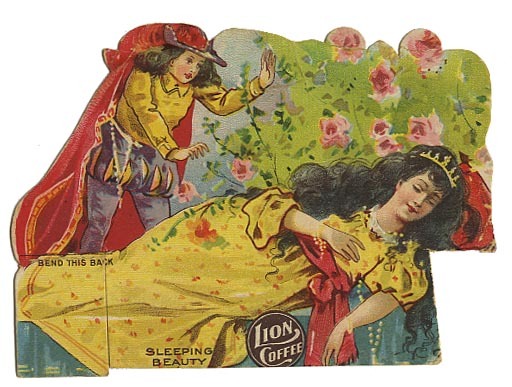 A lot of the regular rectangular trade cards of that era survived because people were encouraged to collect them and save them in albums.There were probably some who carefully saved the paper dolls instead of giving them to children to play with. Yup, every once in awhile I'll see a scrapbook for sale full of the trade cards. Someday hopefully someone will find mine and think they've found a gold mine. I keep them all in archival albums. What a fantastic collection. 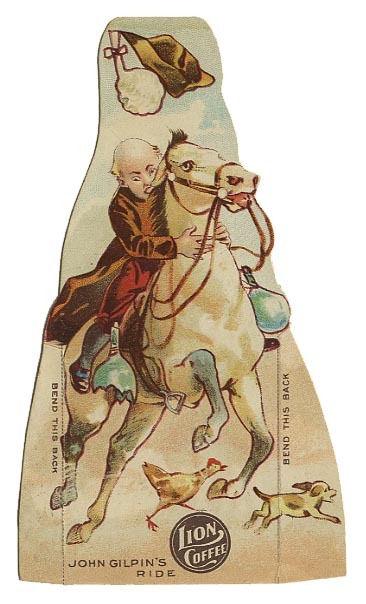 I thought the paper doll in the theme photo this week was a bookmark rather than a toy because it doesn't have any foldmarks. What do you think? I'm guessing it might have a fold at the top of the head allowing the doll to stand when the front and back are opened up. Then again, it would make a nice bookmark. 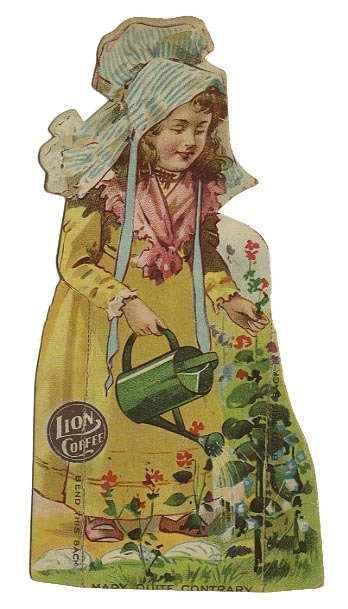 Or a nice little dolly to stick in your schoolbook and take to school with you. Lovely! I don't think we ever had anything as sweet as that in Australia in our coffee or anything else, but I'm no expert. What a marvelous collection. I hope someday you're able to complete it. My favorite is the Frog Prince because it reminds me of the time my daughter was lying in a coma in the hospital. At a local bookstore I found a story of the Frog Princess (she kisses a frog but turns into a frog instead of the other way round) & read it to her - not knowing if she could hear or understand what I was reading, but it made me feel like I was doing something at least. There was a sequel to the story which I also read to her. Who knows? Perhaps that's why she regained her vocabulary so quickly when rehabilitation therapy began? That's a very nice story. Does she think back on the book fondly? I am so envious of your collection. They are just the kind of things I enjoy. Thank you for sharing them. You're welcome. I hope to someday get all of the collection, but many that I still need end up quite expensive. It will take time and the magic word…money. What a collection! I'm surprised so many made it down the years. They aren't easy to find, but thank goodness for ebay. And it's hard to find ones in decent condition. I like the graphic style which looks like the work of one artist. 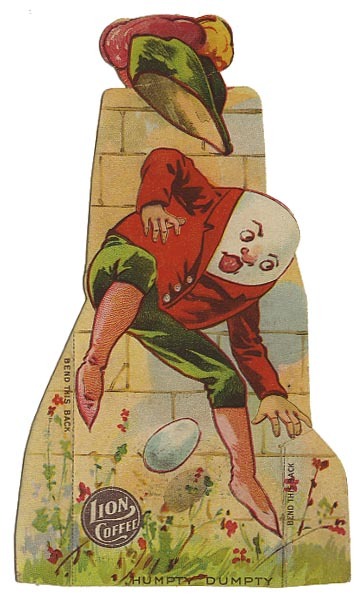 It took a lot of clever craft work to design these in presumably thousands of printed sheets that were then put through a punch, with a different shape for each cutout. A classier collectabile than the cheap premiums in fast food kid's meals. I wish I knew how many the printed. It would be fascinating to know what it actually cost the company to manufacturer them. But what fun it must have been to get one each time you bought their coffee. 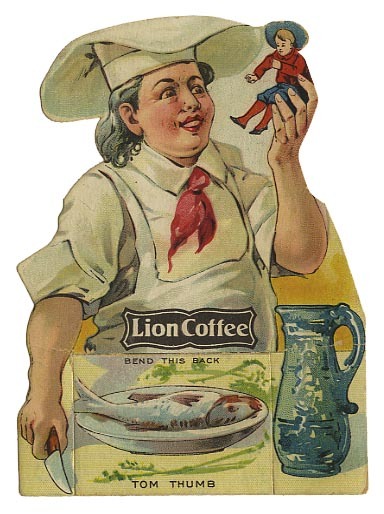 I do think the premiums they used to give away in cereal boxes and Cracker Jacks from the mid-20th century were far superior to the plastic crap in happy indigestible meals these days. What a great match for the theme and what a fabulous series of illustrations. They are works of art that are not only pleasing on the eye but dripping with the essence of history. Such beautiful artwork. I guess the world of cut-out advertisements passed me by because all of this is new to me. These are terrific. I couldn't pick out one as a favorite - I loved them all. I found a "red riding hood" of this series, which prompted me to find this. Sadly it's a bit damaged--it was being used as a bookmark! At least it survived. Not easy to find.